Commander, Air Force Base, Ikeja, Air Commodore Sunday Makinde; State Commissioner of Police, Mr. Zubairu Muazu; Commander, Nigeria Navy Beecroft, Apapa, Rear Admiral Okon Edet Eyo and Commander 9 Brigade, Ikeja Cantonment, Brigadier Nasiru Mohammed Jega, briefing Government House Correspondents shortly after the State Security council meeting presided over by Governor Ambode, at Lagos House, Alausa, Ikeja, on Tuesday, April 9, 2019. Lagos State Commissioner of Police, Mr. Zubairu Muazu (middle), briefing Government House Correspondents shortly after the State Security council meeting presided over by Governor Ambode, at Lagos House, Alausa, Ikeja, on Tuesday, April 9, 2019. 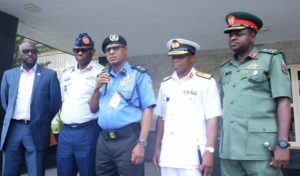 With him are Executive Secretary, Lagos State Security Trust Fund (LSSTF), Dr. Abdurrazaq Balogun (left); Commander, Air Force Base, Ikeja, Air Commodore Sunday Makinde (2nd left); Commander, Nigeria Navy Beecroft, Apapa, Rear Admiral Okon Edet Eyo (2nd right) and Commander 9 Brigade, Ikeja Cantonment, Brigadier Nasiru Mohammed Jega (right). The Lagos State Government on Tuesday allayed fears over the abduction of the Director of the State Fire Service, Mr Rasaki Musibau, assuring that all hands are on deck to ensure his safe return, as well as other victims. Musibau and six others were abducted by unknown gunmen on Saturday night at about 8pm on Iwoye Bridge, along Itoikin-Epe Road. Briefing newsmen after the State Security Council Meeting chaired by the Governor, Mr Akinwunmi Ambode, the State’s Commissioner of Police, CP Zubairu Muazu again confirmed Musibau’s abduction with others, but assured that security agencies were working round the clock to rescue them safely. Muazu, who briefed journalists alongside heads of other security formations in the State, expressed optimism of positive result soon, but declined to give further details on the ongoing operation to rescue the victims. “I confirm that there was incident of kidnapping involving the State Director of Fire Service and all the security agencies in the State are working towards the safe release of the victims. For now, this is all I need to reveal about the kidnap but we are working to ensure their safe return,” the CP said. On the fears being expressed over likely return of the spate of kidnapping in the State, Muazu said all security agencies were working seriously to put a stop to it, adding that there was nothing to worry about. “This present case does not mean that the spate of kidnapping has returned to Lagos. You knew when there used to be kidnapping in Lagos and the situation now. I see this as a very unfortunate incident and I assure Lagosians that all the security agencies are putting their heads together to ensure we put a stop to this menace,” he said. Muazu said the Council also extensively reviewed the security situation in the State since the last meeting was held, just as he said that the government, in partnership with all security agencies, was firming up arrangement to ensure smooth and peaceful transition of government to the incoming administration of Mr Babajide Sanwo-Olu and Dr Obafemi Hamzat. “Let me first say that we reviewed the security situation in Lagos State since the last Security Council Meeting till date and we have critically discussed the security issues arising in Lagos State. “We also extensively discussed the security issues pertaining the handing over with the view to ensure peaceful and smooth transition of government in Lagos State,” Muazu said.